Smitten Kitchen also had a little thing on her webpage so you would know how to make pumpkin puree yourself. For me, that’s like 10 times better than buying canned pumpkin puree. Besides, I was already at the grocery store and couldn’t be bothered to go again. Simple, just roast it in the oven. 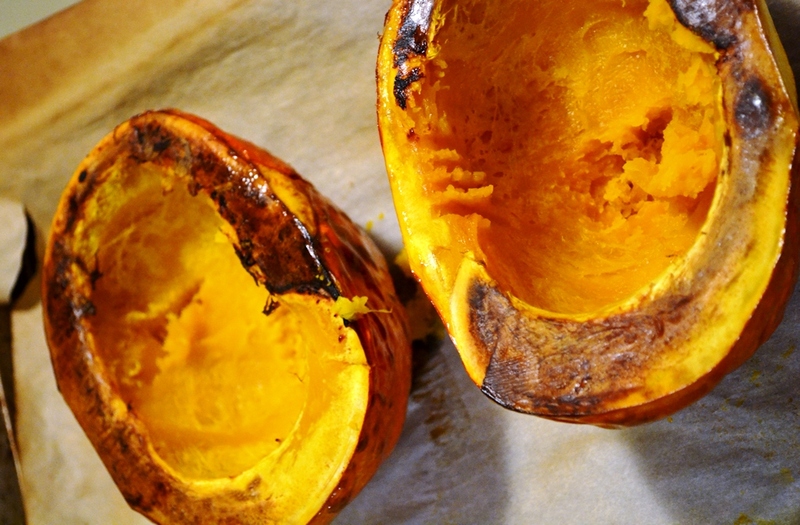 Cut the pumpkin in half, remove the seeds, add a little oil inside and on the outside and place with the cut side down on a cookie sheet lined with parchment paper. Bake at 180°C for about 20 to 30 min. Once the skin starts to brown it should be done. Poke the pumpkin with a work and it should go right through. Though I used a Red Kuri, which usually does not need any pealing, I pealed this one. I simply thought it would be better to now have the skin in the puree. Place the pieces in a blender when still warm and mix until you have a soft puree. I find that adding water helps, I might have not added enough water either. Not sure on it but I got a nice puree out of it though it was kind of sticky. 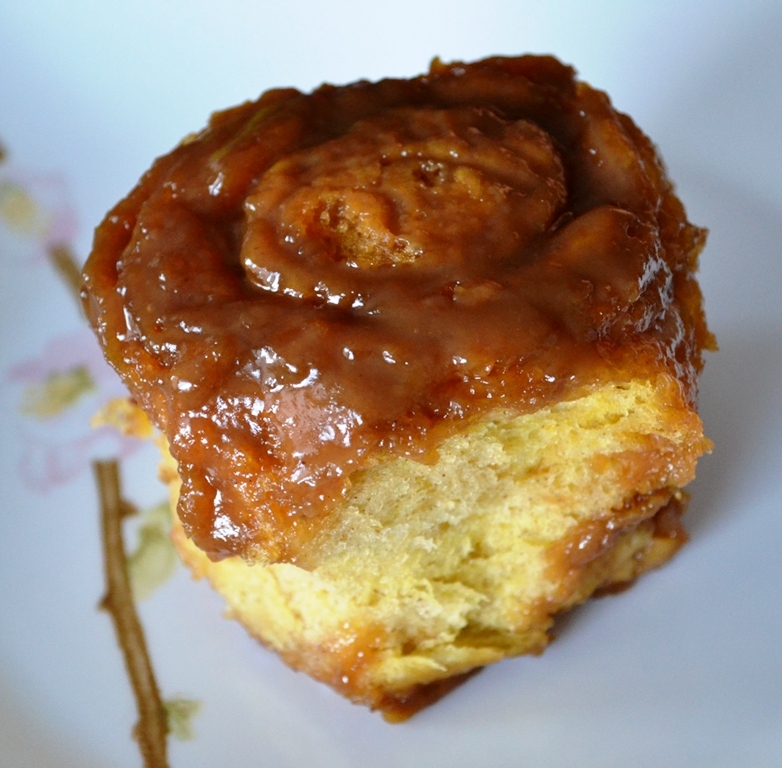 On to the Pumpkin Cinnamon Buns, because that’s what you are here for. Please don’t mind the measurements, I scaled down this big recipe, thus the measurements are a bit odd. I broke up the ingredients according how they go together. First, measure flour, sugar, and salt and place them in a bowl. Then combine sugar, dry yeast and warm water so that the yeast can rise. Make sure that the water is not too hot or cold, otherwise the yeast wont rise. While you wait, heat the milk with the butter so that the butter melts away. But make sure that it is not too hot. When combining everything too hot milk can kill the yeast. Pour milk-butter mix into the bowl with flour, sugar and salt. Add the water-sugar-yeast mixture. 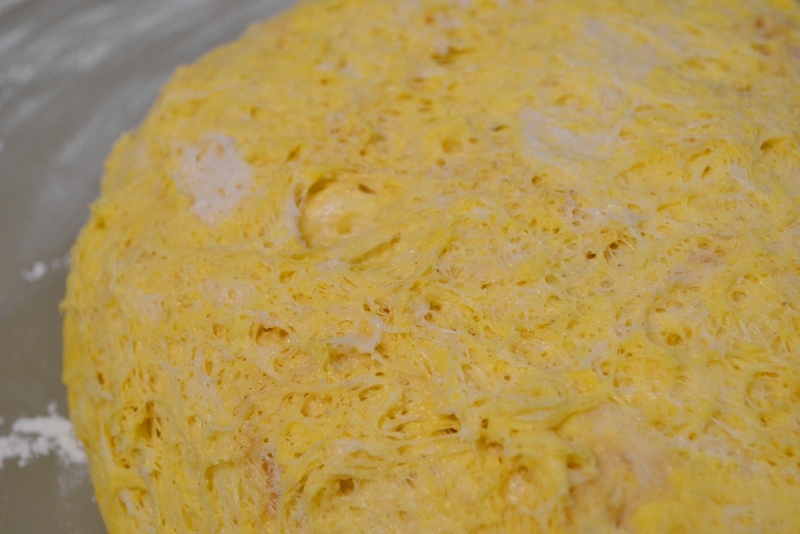 Then add both eggs, pumpkin puree and pumpkin spice and knead thoroughly. I recommend to use a stand mixer with a dough hook but you can also use your hands. Have 1/2 cup flour ready to add gradually until the dough is not too sticky but not too dry either. This really depends on your flour and the pumpkin puree, you might need to add more or less. 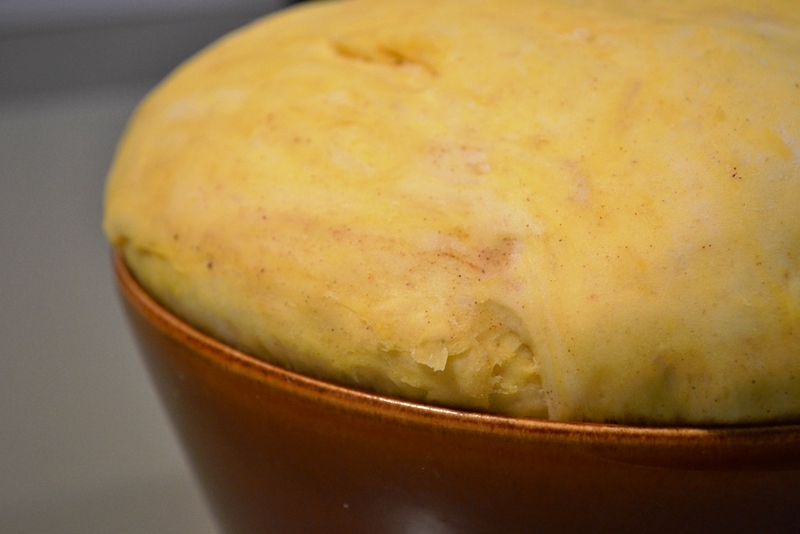 Once you have a nice dough, remove from the bowl and place in one greased with oil. This will make it easier to remove after it rose. Cover with plastic wrap and place in a warm spot with no draft. Let the dough rise for 30 min or longer until it has doubled. While you wait, line a rectangular cake pan with parchment paper and fill the bottom with brown sugar. Pour whipping cream over it so that it is just covered. Place on the oven and turn on so that it warms up. Then remove the dough from the bowl and onto a surface dusted with flour. Carefully pad the dough and roll out into a rectangle, brush with butter and sprinkle with brown sugar and pumpkin spice or cinnamon. If you like you can also add nuts or raisins. 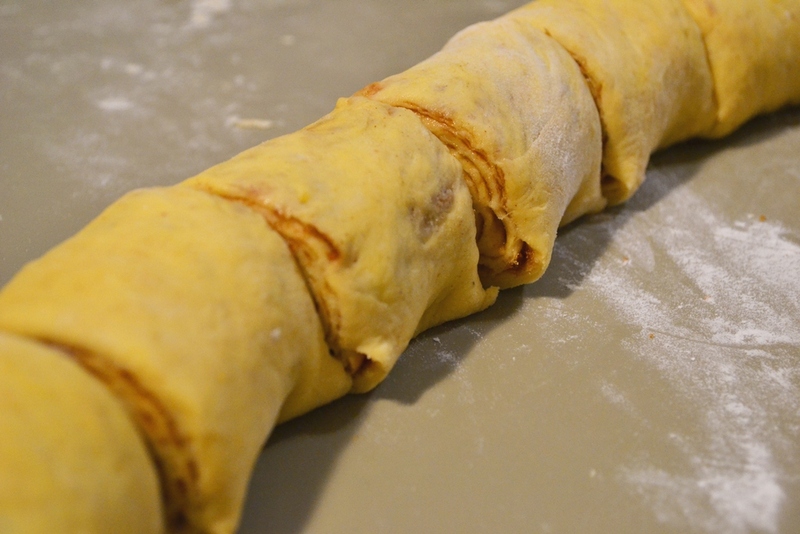 Carefully coll up the dough, slightly pulling towards you so that there is more to roll up. Cut up into as many rolls as you like. I went for the taller ones which gave me 13 but you can make them shorter which would give you more. 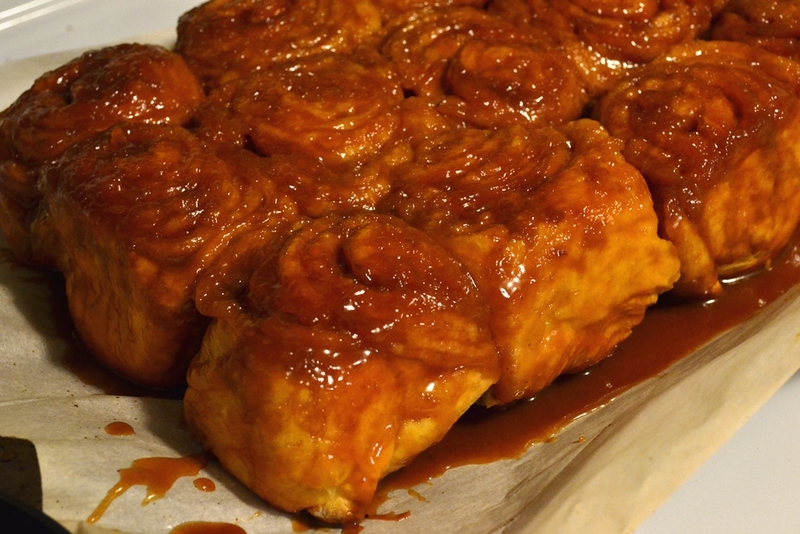 13 Cinnamon Buns fit well into the cake pan, place them in such a way that there is enough space in between. You should put the cake pan on a cookie sheet with and edge in case anything boils over.Let them rise again for 30 min before you bake them at 180°C for 30 min or so. This depends on your oven, so you should check in between. Once you removed them from the oven, flip the pan on the cookie sheet, remove the pan and parchment paper and let cool. 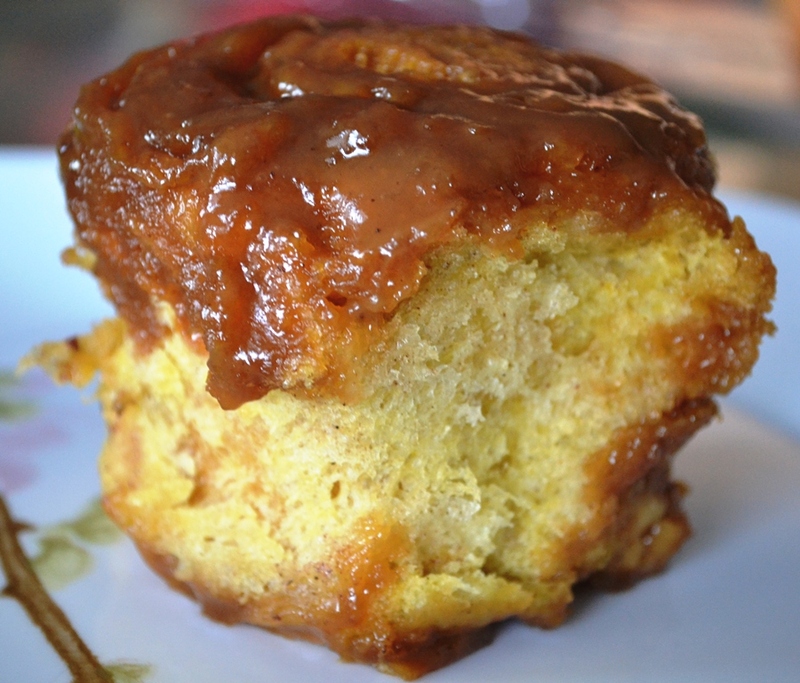 Pumpkin Cinnamon Buns, like regular cinnamon buns, are best served war. Just be careful the goo might be too hot and you could burn yourself. If you would like you can make an cream cheese icing with pumpkin spice and icing sugar. Combine in a mixing bowl until you reached the desired sweetness. This just went into my plantation recipe book! Thanks for the great idea! wowww that looks so delicious and fluffy! You have my salivating all the way here in Australia!